The purpose of kitchen organization or modern Kitchen Brigade System is to make the right quantity of food of the highest standard, for the required number of people on time, by the most effective use of staff, and materials. The reasons which have the most significant outcome by the organization will be the menu and the system used to prepare and present the menu items. a) Hot Kitchen: In the hot kitchen all the hot food will be prepared with the exception of warm, hot desserts and the following departments can be established. The department for cooking of all types of meat, poultry, fish, etc. The department for cooking potatoes dishes, vegetables, eggs, farinaceous dishes. The department for cooking soups, sauces. b) Cold kitchen: In the cold kitchen apartment, all the cold dishes, salads, cold buffet have to be prepared, the preliminary works such as debunking trimming, cutting and portioning for the hot kitchen is done in this department. The executive chef in the big establishment is responsible to the manager of the establishment and works in close relation with the food and beverage manager. The executive chef should have an excellent knowledge of his profession and must have the qualities of a good teacher, a calm disposition and be a good organizer. The second chef replaces the executive chef during his absence. He usually is in charge of the day to day running of the kitchen. The second chef is normality selected by the executive chef in co-operation with the manager; he should have some qualifications as the executive chef and generally with be less experienced and should use his stage and capacities to upgrade himself to become a future Executive chief. The chef saucier is responsible for the preparation of all the warm sauces, and sometimes he also prepares “Party” the garnishes to accompany the meat dishes. He is responsible for all the cooking of the meat, poultry, etc., he should have an excellent working knowledge of the cooking methods such roasting flying, stewing, grilling and braising, etc. and he works in close co-operation with such party and vegetable party. In less large kitchens he also takes care of the fish, sauces and soups preparation. He is responsible for the preparation of vegetable dishes, potato dishes, egg dishes and the farinaceous dishes. He should have an excellent eye on what is being prepared by the roast department to assure that the accompanying vegetables with the meat are suitable and hot. He is in charge for the preparation of the fish dishes, sometimes for fish sauces and fish soups. He is responsible for all stocks, soups, consommés, cream soups, broths, etc. In a lot of cases, this function is combined with the position of sauce party. In places where there is a call for a large number of grills and roast joints, a grill party will be employed, in many cases operation in from of the customers in the dining room or grill room. The staff cook usually provides the meals for the employees who use the staff room this applies in large hotels. He is responsible for the cold kitchen when all the cold starters and dishes are prepared. A lot of his work is the preliminary work for the kitchen as deboning, trimming and portioning of meat, poultry, and fish which goes from his department to the various kitchen departments. In the bigger kitchens, a butchery chef works under his responsibility and supervision. He is responsible for deboning trimming, cutting mincing and portioning meat, sausages, and Pates. Often his function is executed by the larder chef. A night cook was employed to be on duty part of the night and all night if necessary to provide late meals. He is in charge of preparing all the desserts, pastries and bakery products of the kitchen brigade system. The Baker chef prepares under his supervision, the bread, and Danish pastry products. The duty cook was employed when split duty was involved; this chef was on guard to do any orders in the kitchen, during that time when most of the staff was off duty and also for the late period when the other staff has gone home. Split duty hours involved a break from approximately 2:30 p.m. to 5:30 p.m. Usually, a commis would be on guard in the larder and pastry. He is the charge of a particular department during the absence of the party Chef. 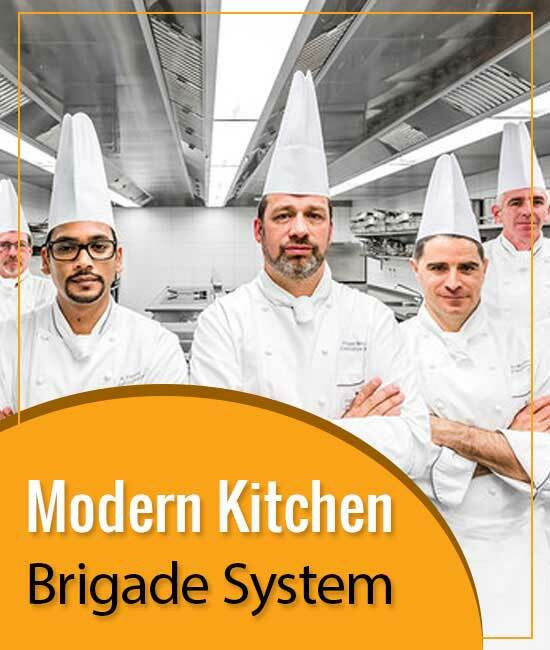 He must have a good knowledge of all departments of the kitchen brigade system and should use his stage and capacities to upgrade himself to become a future second chef. The party chefs are assisted by commis or assistants, the number varying with the amount of work done by each party.